It should go without saying that abortion is unsafe for the unborn, but it is bad for the mothers as well. See The Case Against Abortion: Abortion Risks, which outlines serious risks such as breast cancer, uterine damage, complications in future pregnancies and death. The foundational arguments against abortion are not rooted in its potential danger to women. Abortion is immoral and unjust because it kills a living human being. The safety of a particular activity does not make it right or wrong. The impact it has on other people does. With that said, there are two reasons why we survey the medical risks of abortion. First, some women (and men) are not particularly concerned about the violence abortion does to their offspring; far fewer are unconcerned about the violence abortion might do to themselves. A greater understanding of the medical risks may dissuade them from ending their child’s life. Second, the abortion industry’s consistent reluctance to provide women with information that portrays abortion in anything less than a positive light is strong indication that they may care more about money and politics than they do about a woman’s health. If they didn’t have a vested interest in her “choice,” why do they lobby so hard against having to more thoroughly disclose to women what abortion is and does? It is a scientific fact that the unborn are unique, living human beings from conception. Abortion kills those human beings and is therefore immoral except to save the life of the mother. Abortion is a sin but forgiveness and healing can be found in Jesus. Pro-life responses: Easier than you think. some simple but accurate responses to use when you hear them. 1.
the emotional “conservatives want to control women!” theme. 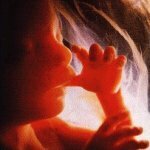 fact that the unborn are human beings from conception. argument fails even if we didn’t help out. I encourage you to visit Too Many Aborted to learn more about what abortion has done in the black community. As you may know, the rate of abortions for blacks is three times that of whites (and Hispanics are double that of whites). Of course, those ratios aren’t high enough for pro-aborts, as they want to have taxpayer-funded abortions so you can help increase them. The Religious Coalition for Reproductive Choice is one of the most vile “religious” organizations in existence. While they can’t agree about who God is, they are certain that all religions support unrestricted abortion and that abortion is swell for blacks. How ghoulish. If pro-lifers favored an issue that resulted in a dramatically higher mortality rate for blacks it would be on the news every day. Yet most people aren’t aware of this. To state the obvious, abortions kill innocent human beings whether they are done to blacks or whites. This isn’t science versus religion, by the way. It is a scientific fact that the unborn are unique, living human beings from conception. Theological liberals oppose science and religion when it comes to life. In “Jesus healed the sick, you can stop the cause,” false teacher Chuck “Jesus is not the only way” Currie, who is pro-legalized abortion and wants taxpayer-funded abortions but hypocritically zmentions Jesus’ concern for the “least of these” in many of his posts, really outdoes himself and his fellow pro-aborts. While parading their religiosity in opposing chemicals, he lists some alleged religious values. Not how their extreme pro-abortion views mock each of these. All life is to be respected. All life except unborn life, that is. The unborn are human beings from conception. Abortion kills them. People of faith must ensure that air, water, and land – which belong to the Divine – sustain life on Earth. The unborn are on earth. They also belong to the divine. But Chuck & Co. think it is OK to crush and dismember them. Heck, they don’t even see the need for anesthetic, regardless of when the abortions are performed. His hero, President Obama, even thinks you can kill them outside the womb if the abortion fails. Who is more vulnerable than a baby fighting for her life in her mother’s womb? Why won’t Chuck protect her? And what could be a more obvious impact to future generations than killing them? Our faith traditions call us to protect and promote the health of the human body. Does this look like it promotes health to you? False teachers like this are the worst of hypocrites. 4,000 human beings were destroyed in the U.S. alone today, with Chuck’s blessing and the blessing of his peers. That’s just sick. See The FBI Seems to be Missing the Story on Abortion Clinic Violence | Verum Serum — looks like all that “hate speech” by pro-aborts against pro-lifers is the cause for all these examples of pro-abortion violence. People like false teacher Chuck “Jesus is not the only way” Currie, who is pro-legalized abortion and wants taxpayer-funded abortions but hypocritically mentions Jesus’ concern for the “least of these” in many of his posts, are the culprits here and should be held accountable for their hate speech. Oh, and don’t forget the violence committed 3,000+ times per day against the unborn. Their hate speech is also responsible for that river of blood and must be prohibited by the force of law, even if it silences their “pro-abortion Christian” religious speech. I’m being sarcastic, of course. I respect Chuck’s free speech rights to be a fake Christian and a pro-abortionist. I’m just pointing out his hypocrisy in playing the hate card with those he disagrees with instead of using facts and logic.